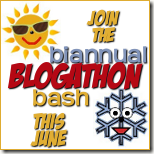 Okay, so for the first part of this challenge, you are to read this: Want a Faster Blog? Take Your Images to the Cloud! For a bit of re-iteration, the cloud acts much like how torrents do. Remember, back in the day when you downloaded a torrent (for something totally legal, like… well, there had to be a legal reason for torrents right?) and only 1 person was around for you to download the entire file from. You could sit there and beg and plead for another two or three people that had that exact same file you wanted to download to come online just so the download speed would be faster. Really early on, in the days of dial-up, the difference of speed was equivalent to either taking days to download one simple file versus hours. Remember that? The cloud works much in the same venue; your files are held in multiple, fast running cloud servers and that allows for your readers’ computers to render (see) the images faster. ‘Cause by uploading those images to your current non-cloud single-server, your readers are watching your images appear as fast as one server can handle. Bottom line: work with the Cloud makes it all that much faster for you. If you have a popular blog, the free subscription isn’t all that great if you want to host ALL of your blog images with them. I ran through the 1GB of monthly bandwidth in two weeks! Eek! This brought me horrific flashbacks to the days of photobucket and the trials of hotlinking, and those are simply bad memories that should stay in the past. The really admirable thing about Cloudinary is that they don’t immediately take your pictures down once you’ve past your bandwidth limit for that month, they keep everything working smoothly so that only you would know that you have to upgrade your account as soon as possible, and your readers can still see your fabulous blog posts without interruption. I decided to look into the subscriptions further, ’cause I really do love the service. Cloudinary has made it so easy to add blog images to your post without much effort on your part, but this is what I saw for subscription ranges. Yeah, for me? That basic plan would be a no-can-do-pal-plan! EDIT (June 23, 2013): I received this comment from Cloudinary, though I’m not sure why its not showing up below… There’s great news for bloggers! “Hi Aeryn. Thank you so much for writing about Cloudinary! Cloudinary actually has a smaller plan that might better suit your needs. 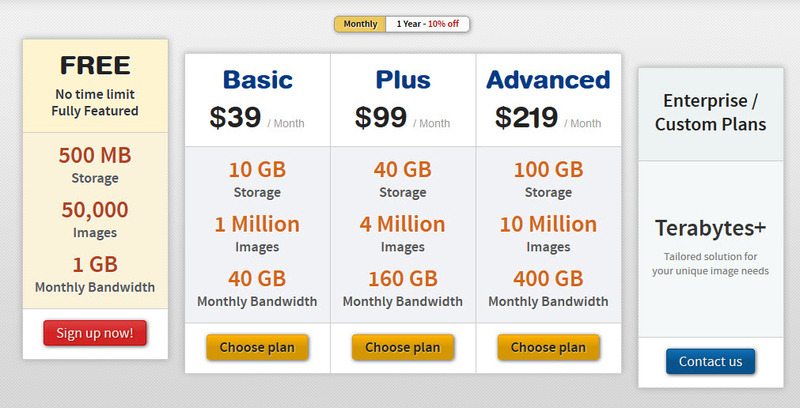 This plan covers 10GB of monthly bandwidth and 2GB of storage, for $10/month or $9 if paid annually. It’s not yet listed in our pricing page (which is still more focused on our website developers than our WordPress community). To upgrade your account to this new plan, login to your Cloudinary account and use the following link – https://cloudinary.com/users/upgrade/small. If you ARE techy-inclined though, Amazon’s S3 cloud servers will be much better for your needs and I completely recommend taking advantage of their products. First of all, if you haven’t set up an account with them yet, you’ll get your first year free with 5GB of hard drive space to do with as you please, and the rest of the details can be found here. I wanted to write a how-to on using Amazon’s AWS, but I can’t write everything you need to know and do in one blog post… its actually more like a How To book, so yeah… I’ll let you know what that’s completed! 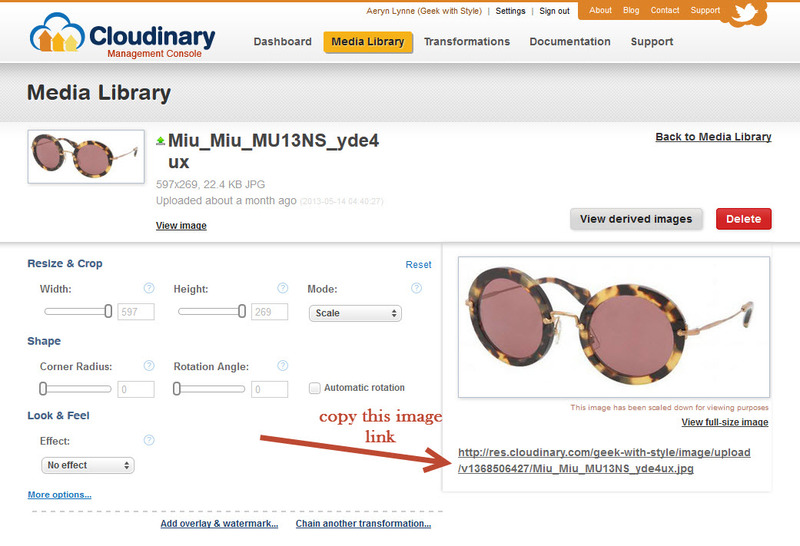 Once you’re logged in, click on Media Library and drag and drop all the photos you wish to upload into the box provided. Once those images are uploaded, you can click on each image to find their specific link that you’ll be using to add images to your post. This part won’t be part of this challenge, because this change depends on how well you know your blogs theme/template, (and get help if you need to,) but you’ll see a great improvement on your site’s loading time by using the cloud to host your blog’s header/logo image. This image is shown on every page and is THE most common image that any browser will have to download/read to show any given website. If you have a rather large image that takes forever to see when you’re accessing the front end of your website, you can change the speed of your site immensely just by moving this one image to a cloud account like Cloudinary. Again, this may require fooling around with the code of your template, so get help to do this if you need to! GAH now I have to create a cloud….so far I hate clouds…but you are making me think I need one! Only you could do that! Created.. although I’ll probably use it all up and have to buy extra LOL. I created mine. We will see how awesome it is. It seems pretty cool and easy to use. Hadn’t heard of this before. Thanks for the post! Hi Aeryn. Thank you so much for writing about Cloudinary! I did it (and used your link)! I think my biggest problem, is I never resize images before uploading. I’m going to have to fix that. Signed up for a free account! Thanks for this information! I signed up for an account, but I’m not sure if I’ll really use it. Time will tell though. I signed up! Thanks for the tip 🙂 I use photobucket for my header etc. Is coludinary better? CrazyCasaK Awesome! Yes, definitely Cloudinary is better in the case of your site header. It’s been a while since I’ve used photobucket, but at least back in the day PB would reduce the quality of your image (again, not sure if they’re still doing that.) But more importantly, your header image will load faster with Cloudinary due to their faster cloud-based servers. PB is more of a photo gallery these days, whereas Cloudinary is an image repository that only you can see and edit if needed. I’d never heard of this before! Just signed up for an account, and used it tonight to move some photos over. SUCH a smart idea – and I’m so in need of tips to speed up my site. Thank you!